I just got back from an amazing 10 night family vacation in Costa Rica. My wife and I had previously visited the country for our honeymoon but this time we went with our two boys (4 and 15) and my parents. It might not have been quite as relaxing this time around, but it was still a great experience. A few stories from our trip helped reinforce some important lessons to me about money and life, so I thought I'd share them. Money Perspective - After arriving in San Jose and making our way through customs and into our rental car, we quickly were introduced to the local currency. We hit a toll booth after a few minutes on the road and our 15 year old was shocked when he read the sign and saw the toll was 2,000! After a brief panic over whether they'd even take our US dollars, we assured him a $5 bill would be enough. Of course the price was in the local currency of colones, which are exchanged to US dollars at around 570 to one. So that 2,000 colones toll was actually less than $5. While most places in Costa Rica do accept American dollars, and a few even list out their prices in dollars, most are still listed in colones. During our first few days we spent a lot of time debating the prices of things and doing math in our heads or on our phones, but by the end of the trip we had it down. Suddenly we knew that spending 4,000 for a burger wasn't such a bad deal. It's always been amazing to me how quickly we adjust our price expectactions to our environment and it's important for us to be conscious of that environment. It felt very strange at first to see the gas pump going up by the thousands but it didn't take long to get used to it. While going on vacation won't permanently adjust your perspective, this lesson can be applied in everyday life as well. When you graduate college and go from eating Ramen noodles to working alongside professionals going out to fancy dinners every night, you might be inclined to adjust to that new environment and overspend. Or if you move from a small town with a low cost of living to a big city where everything is expensive, a $10 drink might suddenly look a lot more reasonable than it did before. Be aware of your environment and how it is affecting your spending. The high prices also drove home to me how easily credit cards make you lose sight of prices. Imagine having to carry thousands of colones around with you everywhere instead of just swiping your card. You've probably heard it said before that using cash helps keep your spending in check because you are much more aware of what you spend when you have to hand over cash. While I love using my credit card to get points, I can readily admit I would have spent much less on our trip had I stuck to using cash. Different Culture, Same People - The second night of the trip I ventured into the small town of Nuevo Arenal to pick up some groceries. It was a small grocery store with plenty of locals hanging around outside and very few spoke English. As I pulled away from the store, someone started flagging me down. I naturally got defensive and worried he meant harm but then I saw him pointing at my car and yelling flat flat flat. I stopped and looked and sure enough I had a flat tire. Luckily, I was directly across from a gas station so I thanked him and pulled across the street. Instantly two helpful workers from the gas station rushed over to assess the situation. They also spoke no English but quickly found the source of the leak, got out their tools and plugged the hole. They filled the tire with air, gave me a bill for 3,000 colones (less than $6!) and sent me on my way, all in less than ten minutes! Talk about lucky - had that person not waved me down, I likely wouldn't have noticed the flat until I was on the dangerous curvy road back to our house that had nowhere to stop and fix a flat! I always enjoy travelling to different countries to take in the local culture and meet different people with different perspectives. I find it even more important to do so now with my kids to expose them to different cultures as well. Yet despite our many differences, this episode reminded me we are all the same people and most people in this world are kind and look out for each other. This local could have looked at me as a typical American tourist and ignored the flat tire on my car, but he took the time to wave me down. The gas station employees could have easily taken advantage of my situation and overcharged me or tried to sell me a new tire but they didn't. There's a lot of good in this world, if you just keep your eyes open and look for it. Wealth Isn't a Reflection of your Net Worth - One night my wife and I went out to dinner while my parents watched the kids. We made friends with the bartender and were chatting with him while we took in one of the spectacular daily sunsets on the coast. I told him how lucky he was to have that view every night. He told me about a friend of his who left Costa Rica for the U.S. to become a lawyer. He is doing really well and drives a fancy BMW and has a beautiful wife and kids. But he said everytime he sends his friend a picture, that friend tells him he is the one with the the perfect life there in Costa RIca. This, despite the fact he doesn't drive a fancy car or have a lot of money. He works hard in a small restaurant but he has everything he could need. We work with clients of all levels of income and net worth. We see multi-millionaires who spend too much and get caught in a rat race of always having to earn more. We also see people with a few hundred thousand dollars saved but who can retire comfortably and happily because they live within their means. My dad has an article up this month about his experience at a yoga festival earlier this summer where the focus was on finding your "True North" and understanding what's truly important to you. This bartender clearly understands what's important to him and is truly happy living a life without many material possessions. Don't let money be your guide in life, let it be a tool to help you live the life you dream. Experiences Are Greater Than Things - On more than one occasion on our trip my 4 year old told me, "This is the best day ever." Whether it was fishing all day in the pond or swimming in the calm warm waters at the beach, he was in heaven every day of our trip. My wife and I both work hard and enjoy taking lots of vacations with our kids and this is exactly why. Nothing can replace the time we spend on these trips with our family and nothing leads to greater satisfaction than hearing a 4 year old tell you it's the best day ever. 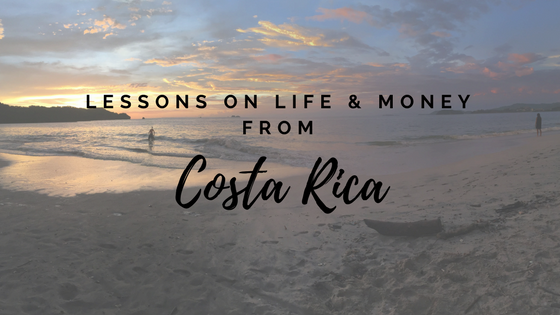 It doesn't have to be a trip to Costa Rica, although I highly recommend you visit if you can. I could've taken a few days off work and taken him to the pond down the street and he would've been just as happy. What's important is to have that experience and spend that time. We all know that time is our most valuable resource, so make sure you spend it wisely.